BBQ. Yes, we do have that in Vancouver; but it's far and few in between. In fact, it really shouldn't even be put into one category. It's the same as saying there is one type of Indian or Chinese food. However, it is a reality. 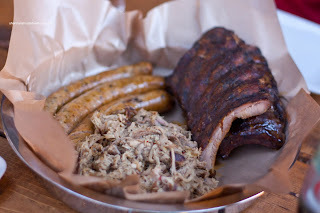 The problem is that most people are familiar with "BBQ" from chain restaurants such as Montana's and Tony Roma's. As much as I don't mind it personally, there are those purists who would be offended by the parboiled then grilled meat slathered in sauce. So a place like Peckinpah might be misunderstood since it specializes in Carolina BBQ. This type of BBQ is smoked with a dry rub with sauce served table side. With that being said, I'll admit it right now - this is not my personal preferred form of BBQ (as much as it is authentic). This brings up another important point: if something tastes good for one person, is it important if it is authentic? Sausage to be the highlight of this plate. They were very meaty, juicy and full of flavour. There was just the right amount of spice which gave a kick but did not mask the meat taste. The Pulled Pork was sufficiently moist and when combined with the vinegary BBQ sauce, it was pretty good. The Back Ribs were predictably dry; yet not overly so. There was a nice smokiness to them. the pulled pork except texturally being slightly chewier. 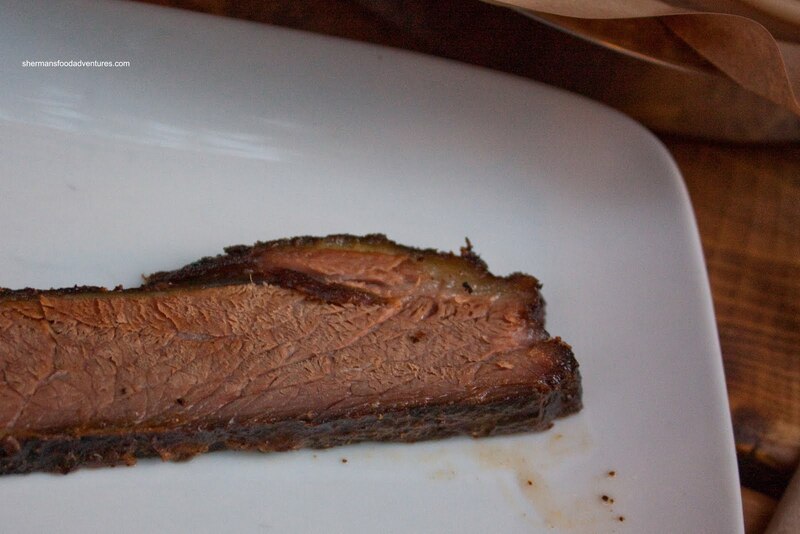 Unfortunately, the Beef Short Rib was severely dry and in fact, half of the meat was inedible. It seemed like the whole rib was bark with no meat. This was a complete disappointment. For our sides, the star was the Hush Puppies with bourbon mustard dip. My goodness, these rocked. They were crisp and warm inside; yet the dip stole the show. We could've drank a cup of this sweet bourbon mustardy goodness. 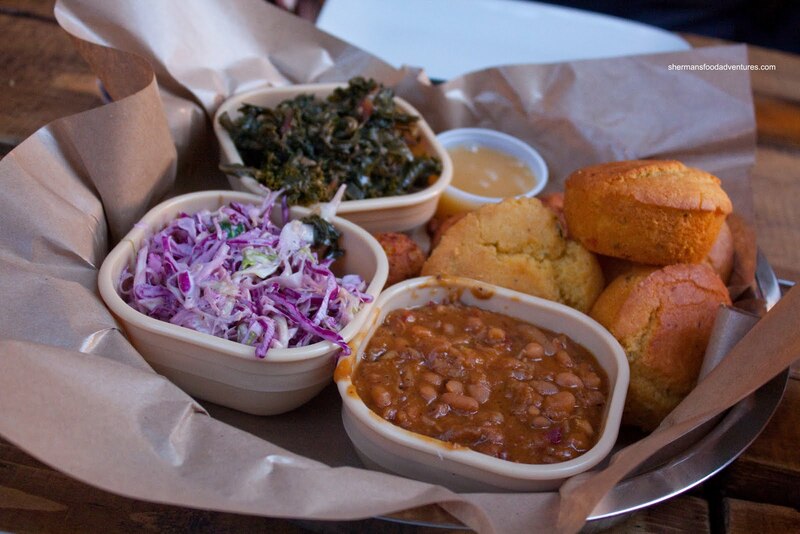 It was so good, we even dipped the Cornbread into it. As for the cornbread, it tasted okay; but again, the dry theme takes over again. The Coleslaw was fresh tasting and crisp. Would've liked a bit more tang though. The Baked Beans were pretty standard and we didn't mind them. They were mostly sweet. We did like the Collard Greens though, it was prepared the classic way with onions and bacon. 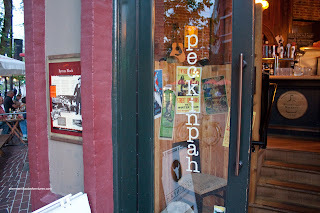 Okay, as a collective, we were not really all that down with the BBQ here at Peckinpah. Don't get me wrong, there were some highlights, like the sausage and pulled pork as well as the hush puppies. But the inedible short rib and brisket really put a bad taste in our mouths, literally. I give you kudos for reviewing the unusual, the out of the way, and the hole in the walls. The food you review is worth a read. Your mention of the sport you play, every. single. post. Is unnecessary, and makes your already long posts hard to get through. The camera excuses this time has spurred me to say something. I dont care about the camera details. You could have said "the setting sun made getting great pictures impossible" and done. This is a blog I want to recommend to my BOH coworkers or anyone, but I can't. Not until the unneeded verbiage starts to get edited. Keep doing what you do, maybe just a little less of it. That's acutally a good question about something tastes good vs how authentic it is. I am lucky so far that I haven't dislike any authentic food that I tried yet. We shared an order of back ribs with baked beans and cole slaw. As expected, we both love the sweet, smoky intense ribs. They were not fall-off-the-bone tender but I didn't think they were dry or unpleasant to chew and eat. I tried their bbq sauce and the chili vinegar sauce and prefer a few shakes of the vinegar over the ribs. The sides were good but not exceptional. 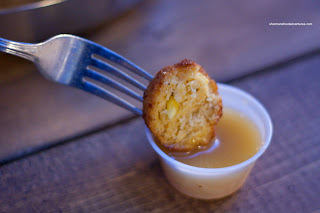 After reading your post, I think we need to head back for the Hush Puppies! @Winnie Actually, we thought some of the meats were quite good and most were okay with the BBQ sauce. It was mostly the shortrib that couldn't be eaten was the big downer. Hush puppies were awesome! @Saddler You bring up some good points. However, I do not write professionally or for a publication. Hence, it is still and always will continue to be a personal blog. Thus, we have some personal thoughts and instances mentioned. I generally write for myself despite it appearing as merely a food blog. If I start writing for others and not state my personal opinions and hijinks that occur in relation to the restaurant visit, I would have strayed from what makes it a passion of mine. Honestly, I really don't mind you or others not recommending my site. I'd rather not waste the time of those people who do not like or agree with my blog. They can read or do something that they prefer. It would also save me the grief of trying to respond to shills and complaints. I'm not out to please everyone. But thanks again for the feedback. - Yes, we know it is supposed to be dry; but if you can't even eat it..."
I'm just curious as to why you think this is supposed to be dry? Just because it is dry rubbed and not sauced doesn't mean it shouldn't be juicy. 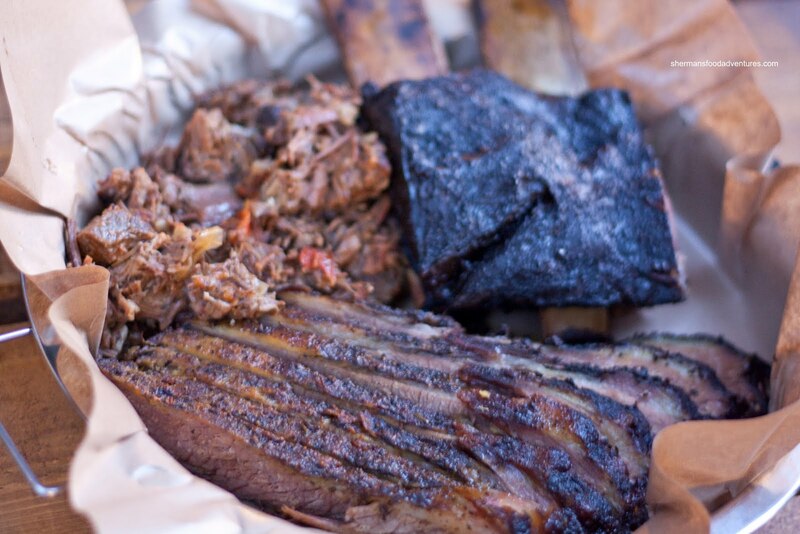 If it was dry, then that is simply a poor execution of the smoking process or sat around too long before being served. @Brad You are absolutely right in terms of being moist. I'm pretty sure that Carolina BBQ would never be classified at "juicy" but it should be less dry than what we got.